When we first sat down with Jocelyn Arndt last year, the powerhouse singer blew us away with acoustic versions of her songs “Where’s The Rain” and “Shame.” In addition to being incredibly talented, she is also extremely determined; within the last year alone, Jocelyn and her brother Chris have logged more than 100 performances (including sets at The Sundance Film Festival, Mountain Jam Music Festival, CMJ, and South By South West) and have released their newest album Edges (which is available for purchase here) – while they both attend Harvard University. If that’s not impressive, we don’t know what is. For this edition of GirlTalk, Jocelyn has put together a playlist of her favorite female musicians, promptly titled “Songbirds and Rockstars and Divas, Oh My!” The playlist features songs from Aretha Franklin, Adele, Pat Benatar, Joan Jett, and Nina Simone to name a few. 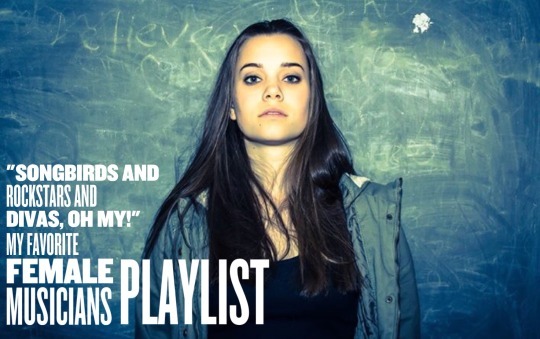 Check out Jocelyn’s playlist below, as well as on Spotify here! For this list, I’ve chosen songs that really inspire me, musically and otherwise. All of these tunes feature female lead vocalists I grew up listening to (I listen to guys, too, but for the sake of this mixtape I’m sticking with the leading ladies). These are some of my absolute favorite voices; I love singers who are so distinctive that you know who they are two seconds after they start belting it out. These women shaped me into the performer I am today, and I’m so grateful to all of them for showing me just how inspiring and powerful chick musicians can be. You can probably hear some of their musical influence on Edges, the full-length album my brother and I just released. YAAAASSSS QUEEEN. SLAAAAAAY. Aretha’s in a class of her own. Power, sass, and control all wrapped up into one vocal force of nature. She was one of the first performers I ever heard that made me feel exactly what she was singing about. Not just hear it, but actually feel it. And this song is pure gold, too (not to mention she sings it during her guest appearance in The Blues Brothers, one of my family’s go-to Friday night movies). Ah, Grace. She’s been a hero of mine for quite a while. I stumbled across this song on Youtube in middle school, and it changed my life. Seriously. And last year, Chris and I got to share the bill with her at the Mountain Jam Music Festival! We actually got to stand on stage right to watch her perform. I almost died. And then, when I thought the day couldn’t get any better, we got to see Robert Plant and Gov’t Mule, too. Danny Louis from Gov’t Mule actually ended up playing Hammond on a bunch of tracks on our new album, which was amazing. I don’t think any playlist is complete without my girl Paula Abdul making an appearance somewhere. We actually cover this song live… We change it up to give it a little more of our blues-rock edge to it, but it’s still got that characteristic Paula flair. Also, if you haven’t seen this music video yet, you should totally check it out. Not only is Paula incredibly sassy, she’s also an absolutely amazing dancer. Which is beyond me… When it comes to dancing, I’m awkward as all getout. I used to take tap dance lessons when I was really little, but I begged my parents to let me switch to piano instead. That worked out a lot better. I can still admire amazing dancing from afar, though. You go, Paula. ZZ Ward is one of my newer favorites. Chris and I are on the road with the band so much these days that we rarely get to see concerts anymore; we’re usually playing somewhere ourselves. We did manage to squeeze the time to see ZZ play a few months ago in Boston, though, and it was awesome. This chick puts on one hell of a show. Pat Benatar is the original queen of rock and roll. My parents have one of her greatest hits cds, so I grew up listening to her. I just love the power of her voice. We’re also around the same height, topping out at a whopping 5 feet tall. I always liked the fact that one of the strongest voices ever came from someone as short as me. I grew up wanting to be just like that, to have a powerful voice even though I was tiny. Pat proved it was possible. Whitney HAD to be on this list. She just had to. End of story. This song is earth-shattering, and she always sang in such an effortless, graceful way. We lost this legend way to soon. Fiona Apple’s voice has this grungy, growly quality I really love. She’s not afraid to sing exactly what she means, and she also never hesitates to sound gritty or angry when she wants to. I admire her for showing that singing doesn’t always have to be about sounding pretty. Sometimes that just isn’t the best way to get your message across. When we were recording the vocals for our LP Edges, I really tried to take that to heart. I wanted to sing with as much emotion as possible, to make the audience feel what I’m feeling when I sing. Here’s another singer who’s never afraid to be gritty and real. Joan Jett was a pioneer. She still is, actually. She wasn’t afraid to be exactly who she wanted to be. That’s something I always want to be able to say about myself, too. Janis, Janis, Janis. She sang like no one ever had before. That sounds cheesy, but it’s completely true. Whenever anyone asks me who my influences are, she’s always on the top of the list. For the too-short time she walked the earth, Janis was the leading lady of the rock-and-roll world. She always left it all on the stage. Like Janis and Whitney, Amy Winehouse is another visionary singer we lost way too soon. I watch live videos of her performances all the time; it’s like studying for me. She had such a soul to her voice. Chris just got Back to Black on vinyl, and listening to it is a near-religious experience. Grace Slick just oozes coolness. Sometimes people tell me my voice sounds a little bit like hers. I’m not sure about that, but I definitely take it as a huge compliment. This song is also really cool, if you’re okay with a little psychedelia. Grace Potter and the Nocturnals do a cool cover of it, but I’ve always gotta give credit to the original. If Joan Jett is the godmother of rock, Lzzy Hale of Halestorm is her goddaughter. I love this song because it showcases the band’s more sensitive side; the lyrics here are uncharacteristically vulnerable. Their harder stuff rocks too, but I like that her voice can pull off both. Plus, Halestorm is a sibling band; Lzzy and the drummer Arejay are brother and sister, just like Chris and me. Go siblings! There’s something so raw about this song… It’s really special. Nina will always be one of the greats. This is off of another album Chris and I grew up listening to. He’s actually a huge fan of her as a guitarist, too – she’s one of the best slide guitar players in the world. I remember when this music video came out… I must’ve watched it like a dozen times in a row. Lady Gaga is just an amazing entertainer through-and-through. I was sold the minute I saw a live performance video of her playing the piano with her right foot on the keys as well as her hands. Pure gold. And when you strip away the flamboyant set designs and elaborate costumes, she’s also got some serious pipes. If you need further proof of that, look up a video of the National Anthem she just did at the Super Bowl a few weeks ago. This is one of my all-time favorite songs, and it’s one of the first songs I ever decided to learn to play on the piano and sing. The Eagles version is amazing too, but I think Linda’s voice really taps into the song’s meaning. Evanescence! My middle-school angst summed up in one word. There’s a lot more to this band’s piano-driven hard rock than just the black eyeliner, though. Amy Lee literally has the voice of an angel, the perfect blend of edgy and innocent. The Fallen album was one of the first cds I can remember listening to front to back as a preteen. Oddly enough, I think my mom was the one that ordered it from Amazon. I have a pretty cool mom. Fleetwood Mac was an Arndt family staple growing up, and I absolutely love Stevie Nicks’ voice. I think Chris and I draw a lot of songwriting inspiration from these guys. The album this song comes from is special to me because it’s the first album I ever bought myself. I heard “Black Horse and a Cherry Tree” on the radio and I couldn’t wait until the next time we went to Walmart so I could buy the cd and hear the rest of what KT Tunstall had to say. I did the whole thing by myself: found the disc, forked over the bills to the cashier, popped it into the cd player the moment we got back to our minivan. I think the only time I’ve felt more proud of a cd was the moment I got ahold of a copy of our own album, Edges, for the first time. I’m still glowing over that one. You didn’t think I’d make a playlist of awesome female singers and not include Adele, did you? Adele was breaking in to the music scene when I was about in middle school, and I remember hearing her and thinking, “Wow. How does she DO that?” And then I found out that she was only around 20 years old at the time, not that much older than me, and I thought, “If she can do that, maybe I can do it, too”. That’s what I’ve been trying to do ever since; when I sing, I want listeners to hear exactly what I’m feeling and feel it, too. I want to share as much as a can. When I sing, I want to be an open book.